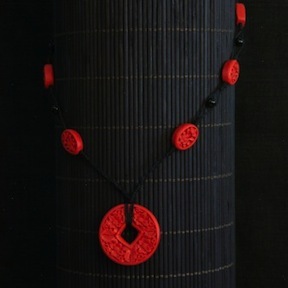 Chinese-patterned, vivid red cinnabar hand carved pendant, sits on hand-knotted dense black cotton string. Part of our Forever Collection, it’s beautiful and intricately hand-knotted and strung with black glass beads and small cinnabar ovals. One of The Butterfly Project’s best selling and favorite pieces.